Sunday November 21st 1920 Hattie went to S S and church and was away in afternoon making calls. Cora was not well but got up before noon. I was up in the garret in forenoon reorganizing my trunks. I read most of afternoon and then went down to Otts. Came home with Hattie. I wrote to Lorie and Joe Woolf in evening. Monday November 22nd 1920 I did a little ironing and some sewing before dinner. Hattie went to town with Rob. I did up the wash and was busy with things most of the afternoon. Ott & Fannie were up to spend the evening. Rob & Cora here part of the time. 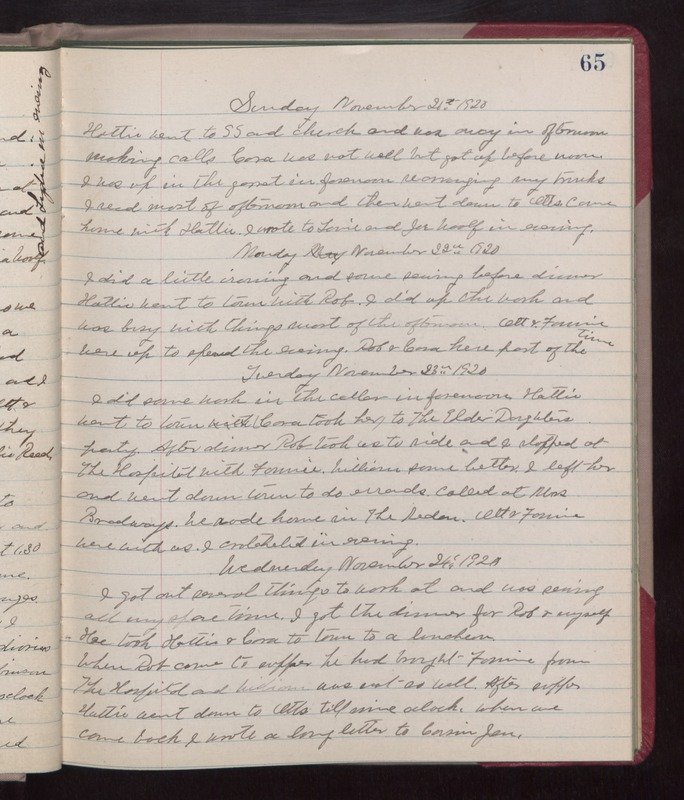 Tuesday November 23rd 1920 I did some work in the cellar in forenoon. Hattie went to town (Cora took her) to the Elder Daughters party. After dinner Rob took us to ride and I stopped at The Hospital with Fannie. William some better. I left her and went down town to do errands. Called at Mrs Broadways. We rode home in The Sedan. Ott & Fannie were with us. I crotcheted in evening. Wednesday November 24th 1920 I got our several things to work at and was sewing all my spare time. I got the dinner for Rob & myself. He took Hattie & Cora to town to a luncheon. When Rob came to supper he had brought Fannie from The Hospital and William was not so well. After supper Hattie went down to Otts till nine oclock. When we came back I wrote a long letter to Cousin Jen.